War Horses for Veterans, a Kansas City-based nonprofit, will be the focus of the Because of Horses podcast on Friday, March 22. 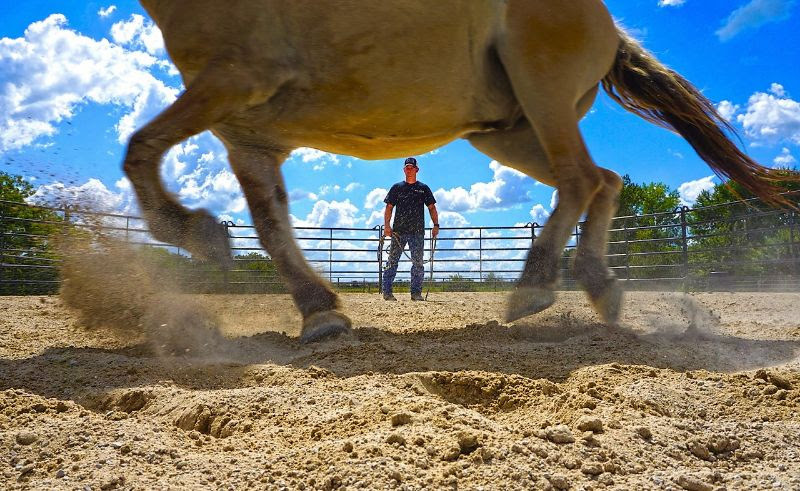 For veterans who are working to transition from active-duty to civilian life, War Horses for Veterans has become one of the premier programs for horsemanship, networking and personal growth. Founded in 2014, War Horses for Veterans is the brainchild of Patrick Benson, an equestrian and Army combat infantryman who served in Iraq from 1998-2004. Patrick recognized the unique challenges faced by veterans, who struggle with depression or PTSD following their service. He knew how beneficial horses had been to his own healing process. Patrick worked with co-founders Andy and Patricia Brown to create the organization, based at their Stilwell, Kansas, property. War Horses for Veterans offers three-day programs during which groups of five to six veterans learn the basics of horsemanship and work to create a network of support. Led by veterans, participants have a safe and peaceful environment in which they can begin to define what they need to learn, change to meet their goals. The program provides an alternative to conventional therapy or medication. War Horses for Veterans expanded its offerings in 2018 and launched a program for spouses. Through a VFW Foundation Grant, War Horses for Veterans has been training volunteers for its Mentorship Leadership Development Program. In addition, the Browns have established an endowment to support the work of the organization into the future. War Horses for Veterans is supported entirely by donations and grants. Veterans do not pay to participate and can return as many times as they wish so long as they bring another veteran. The program also covers airline tickets, lodging and meals. Veterans need not have previous horse experience to participate. Go to BecauseofHorses.com for more.